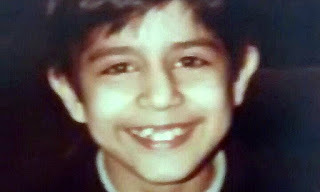 Vishal Mehrotra (above) is believed to have been murdered by the VIP child abuse ring that contained top UK politicians and top people in the UK military and security services. FIELD MARSHALL BRAMALL; VISHAL. 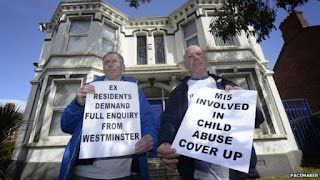 / ELM GUEST HOUSE; MISSING BOYS; LEON BRITTAN. Vishal's body was found 200 metres away from the home of the top UK politician Michael Mates. "Vishal’s body was found on the edge of Durford Abbey Farm, less than 3 miles from Harting. "Peter Morrison ('child abuser') had taken a boy from Harting and assaulted him at Elm Guest House (boy brothel) in Barnes, SW London. 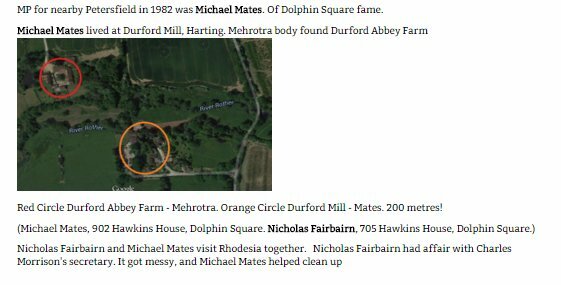 "Michael Mates (MP for Petersfield) lived at Durford Mill as well as Dolphin Square (site of boy brothel) next to Nicholas Fairbairn ('child abuser')." Michael Mates was the Conservative Member of Parliament (MP) for the constituency of Petersfield / East Hampshire from 1974 to 2010. Michael Mates was educated at Salisbury Cathedral School, Blundell's School and King's College, Cambridge, where he was a choral scholar. He served for twenty years in the British Army, leaving in 1974 with the rank of Lieutenant Colonel with the 1st The Queen's Dragoon Guards. 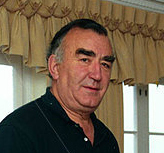 From 1992 to 1993, Mates was Minister of State at the Northern Ireland Office. The Kincora boy brothel in Northern Ireland. Mates resigned after a scandal involving his links to fugitive businessman Asil Nadir. Asil Nadir was said to be involved in the 'Arms to Iraq' scandal. Mates served as the Chairman of the Defence (1987–1992) and Northern Ireland (2001–2005) select committees and chaired the All-PartyAnglo-Irish Parliamentary Group. Michael Mates is the father of James Mates, a senior reporter and presenter for ITN. Anonymous left a comment, on the post "COLBY, BARAK, ROTHSCHILD, EPSTEIN, MAXWELL...", pointing out possible links between the UK child abuse scandal and the sale of arms to Iraq. 1. TheTurkish Cypriot newspaper Kibrisli (13.01.12) reported that Britain illegally sold weapons to Saddam Hussein's regime through a company run by a wealthy British businessman called Asil Nadir. Lord McAlpine persuaded Asil Nadir to give a large sum of money to the UK Conservative Party. 2. The Turkish newspaper reported that "an experienced intelligence specialist, who worked for 20 years with the CIA", told the Turkish newspaper Cumhuriyet that a CIA document shows that the British 'deep state' used Nadir’s company for an illegal weapon's sale. "The documents which contain the details of USA-UK cooperation, along with the cover for the secret weapon sale’s network, expose that the 'deep state' used a series of dirty paths, including murder. "The documents prove that Unipac, a company based in occupied Famagusta and which is connected to Nadir’s Polly Peck, was among a set of companies used for selling guns to Iraq. "According to the intelligence specialist, Mark Thatcher, son of ex-Prime Minister Margaret Thatcher, received a 12 million fortune from a weapons sale and Nadir’s company Polly Peck tried to cover it. "This pushed the button for the company's collapse under the British Serious Fraud Office." Cyprus Expat | Blog: Asil Nadir's Company Used For Selling weapons to Iraq. 3. Asil Nadir ran an international fruit, shipping and leisure conglomerate, called Polly Peck. Elizabeth Forsyth was Nadir’s personal banker. ‘My father Thomas McAlpine of the Scottish McAlpine construction family always treated me as if I was an adult,’ she says. The £29m riddle: Why DID Asil Nadir come back? "Nadir later fled by private jet to his home in Northern Cyprus where he remained until two years ago." 4. Angus James Wilson was the co-founder of Scallywag Magazine, together with his half brother Simon Regan. Angus told Simon "that he had been supplied with compromising pictures of ...."
The photos were of a top cabinet minister, alleged to be linked to the Welsh child abuse scandal. Reportedly, in 1996, Angus took the photos to Northern Cyprus to show to Asil Nadir. Someone "took all Angus's possessions into his own custody, presumably with the photographs." Angus James Wilson died in 1996 and Simon Regan died around 2000. "I understand MI6 used British companies to get around the embargo; many were collapsed to take the fall, leaving a lot of disgruntled businessmen like Gerald Reavney James, Astra. "Scallywag (Wilson, Davis) had compromising photos of Y, which they were selling to Nadir. "Giovanni di Stefano is representing Nadir: he has refused to withdraw allegations re X. "X was somehow connected to the SA nuclear matter. "No wonder there was no libel claim re the Scallywag article." Reportedly, the CIA document, which has not yet been made public, implicates "MI6 agent Stephan Kock" and contains the statement that the arrest of Polly Peck CEO Asil Nadir was arranged through the British Serious Fraud Office. "Claims have also been made that apart from Mark Thatcher, the then Defence Sales Organisations chairman Lord Levene and British Military Services chairman Lord Cuckney had retired after having become millionaires from the arms sale to Iraq. "The CIA document also gives coverage to the suspicious death of experienced journalist Jonathan Moyle in Chile in the wake of the surfacing of allegations concerning Matrix Churchill, Astra and CIA connected Chilean company Allivane regarding the arms sale to Iraq. "Claims had been made that Stephan Kock was responsible for the suspicious death of Moyle who was the editor of the Helicopter Defence World. "There are claims that Moyle was murdered in a way that looked like natural death after he had started investigating Cardoen who was a close friend of Mark Thatcher and was in control of the Allivane company which was planning to sell helicopters to Iraq. "There are other claims which say that the MI6 and SAS were responsible for the murder of Gerald Bull who was killed in an assassination that was carried out outside his home in Brussels. Gerald Bull was a Canadian engineer who was the architect of the arms sale apparently." Some interesting information posted in the article and following comments. Has there been a supply and demand chain in operation via regulatory bodies to meet the needs of the 'VIP's'? Care Quality Commission (CQC) have been made aware of the corruption involving Lancashire Police, Lancashire County Council, the NHS and the unlawful deprivation of liberty of Carol Woods. CQC have been made aware of the involvement of Heather Tierney-Moore in the crimes committed against Carol Woods. Carol Woods was entitled to a Mental Health Tribunal, scheduled for last week - cancelled without her consent. Why is this being denied to her? carol woods is now missing we are worried for her safety on twitter share #carolwoods she was released from the orchard unit Lancaster around 2pm on the 22nd February 2016 on Tuesday 23rd at 425 we had a email carol hasn't been seen since she has been reported missing hope you can do the same direct people to this story reblog share and retweet this. http://www.exposetheestablishment.com/2016/02/carol-woods-missing-ex-social-worker-whistle-blower-lancaster-carolwoods/ Please note her mental health doctor and a sgt from lancaster police did a deal which carol didnt accept her doctor allegedly threaten her with sectioning if she didnt comply. Any news ref carol email Andy freedomtalkradio2013@gmail.com or leave comments on this page or blog.